Seamstress, actor, and college instructor died on April 6, 2013. Noted scholar, educator, and performer died on February 21, 2013. It is with profound sadness that we note the passing of Diane Borst Manning ’59 M’62 and of Carl A. Westerdahl ’59. 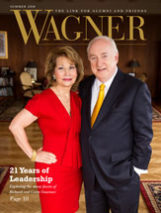 Both were leaders in their class and great supporters of Wagner College, especially of the Horrmann Library. The 2013 Alumni Association Awards recognize campus and community leaders. Pat Dugan ’57 has not merely given to charity. He’s given us all a gift by creating one of the most powerful watchdogs in the world of philanthropy. Francesca Shaw shows off her creativity with her inspired work of art, Social Sillouettes, on display in the Union. What is so intriguing about her piece is not only the technological commentary, but also the joyful and effortless poses of the silhouetted people. The Alumni Association and the Center for Academic and Career Engagement hosted the Student-Alumni Career Conversations event on April 30th. 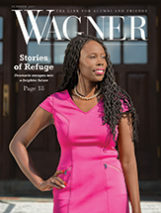 Alumni were able to share their experiences with more than 100 Wagner students who were given this opportunity to connect and interact with professionals from the Wagner family in their aspiring fields. From the moment their eyes met in a French class their freshman year at Wagner, Archie and Charlotte never left each other’s side. 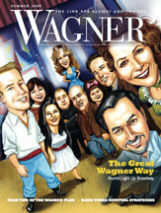 This couple had the makings of a true Wagner Love Story, until Charlotte’s passing in 2012. Archie lets her memory live on through a scholarship that helps Wagner students who want to study English literature, like she did. The highest-profile recruit in Wagner basketball history rediscovers his hoop dreams in a new environment. But first, he faced a devastating loss. Whether you’re interpreting political polls, planning bus routes, or studying wildlife populations, geomatics and Geographic Information Software (GIS) can help you reach your goals. In the spring 2013 semester, Wagner students for the first time were able to take a class introducing them to these powerful methods of employing data.